Teaching employees how to deal with profanity is a part of good customer service. In a culture that adopts the motto "The customer is always right," people sometimes get the idea that it is acceptable behavior to curse at a company's employees over the phone. In his book "Hocus Pocus," Kurt Vonnegut writes that "Profanity and obscenity entitle people who don't want unpleasant information to close their ears and eyes to you." While you should always attempt to work with the customer, you should never put up with verbal abuse. Fortunately, there are techniques you can use that often help to decrease a customer's use of profanity. Reassure the customer that you understand his problem and are working to solve it. Use reflective listening skills. For example, you might say, "It sounds like you are angry that this is the third time you've had to contact customer service about this issue. I understand this is a frustrating." 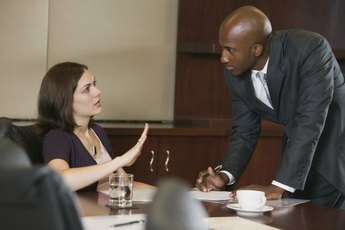 This technique will often help an aggravated customer to calm down and stop using profanity. Avoid arguing with the person, as this will only escalate the cursing. For example, if the person says, "I want to cancel my service now," and you say, "Yes, but first you'll need to speak to a manager," the behavior will likely increase. Instead, say, "Okay, I can cancel your service for you. Let me tell you what you'll need to do. Are you ready?" Ask the person to stop using profanity if the behavior continues. Some people don't realize how out-of-control their speech is or simply have poor speech habits. Telling the customer, "I'd feel more comfortable if you didn't use those words during our conversation" will help some people to stop cursing and speak respectfully. Give the person a warning if he continues to curse after you have let her know it is not acceptable. Tell her, "If you continue to use these words, I'm going to have to ask you to call back later when you feel calmer." Then continue your side of the conversation and hope for the best. Discontinue the call if the customer continues to use profanity. Make a note of the date, time of call, issue and customer name along with the details of the conversation so that you can provide documentation if the termination of the call is reported to your supervisor. Don't take the person's cursing personally. Just be happy you don't live with him and have to listen to the vitriol all day long. If a phone call with an irate and abusive customer leaves you feeling particularly upset, talk to someone about it so that you can process it and get on with your day. Avoid telling customers that a decision is due to company policy, as irate customers are not interested in hearing this answer. Do your best to be flexible and work with the person.